The stock market's wild ride may not be over yet.The Dow Jones industrials whipsawed again Friday, a day after their largest one-day plunge. The average was down as much as 279 points in the morning, went briefly into the black around lunchtime, then ended with a loss of 139. Not quite as terrifying as the brief 1,000-point plunge the day before, but still extraordinarily volatile. 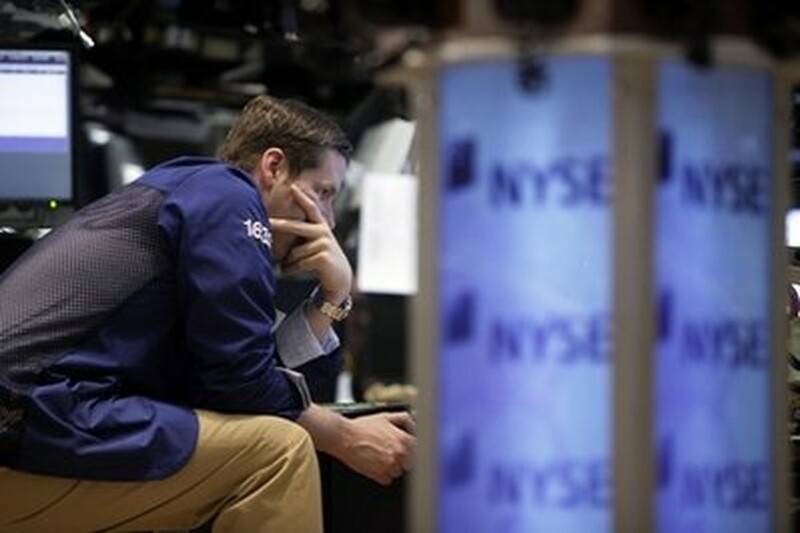 It's normal for markets to trade erratically a day after such a disruptive move, but analysts are divided over whether stocks are in the process of finding a bottom or whether too many investors are too spooked to get back in. "It's a pile of uncertainty ... We don't have any more clarity than we did yesterday," said Art Hogan, chief market analyst at Jefferies & Co. in Boston. "We're going to have investors who are less inclined to be in this marketplace until we get some clarity." Traders were still anxious amid lingering questions about what caused Thursday's sudden drop. Several possibilities were being investigated but as of late Friday no clear explanation had emerged. Investors looked past a surprisingly strong report on the U.S. jobs market and focused instead on the latest moves in Europe's spreading debt crisis. Their concerns have fed a wave of turbulence over the past two weeks, including four straight days of selling this week, and helped trigger Thursday's drop. Technology stocks were particularly hard hit following reports that Nokia Corp. was broadening its legal fight against rival cell phone maker Apple Inc. to include the iPad, Apple's new hit product. Apple shares fell 4.2 percent in heavy trading. The concerns about Europe's debt crisis go far beyond Greece. A further loss of confidence in European government debt could have an impact on other weak countries like Portugal, potentially requiring another difficult bailout process. Germany's parliament approved Berlin's share of the rescue package after a boisterous debate, but investors still fear that Greece may not make a May 19 deadline to make a debt repayment. That could cause ripple effects throughout the global financial system and further undermine Europe's shared currency, the euro. "You're not concerned about the kid with the cold, but how he spreads it to the rest of the class," said Len Blum, a managing partner at investment bank Westwood Capital. Blum noted that Greece's debt problem could be similar to the subprime mortgage meltdown in the U.S., which quickly spread to other parts of the financial system. The Dow closed down 139.89, or 1.3 percent, at 10,380.43. The Standard & Poor's 500 index fell 17.27, or 1.5 percent, at 1,110.88, while the Nasdaq composite fell 54, or 2.3 percent, to 2,265.64. Falling stocks outpaced gainers two-to-one on the New York Stock Exchange, where consolidated volume was very heavy at 9.5 billion shares, compared with 10.4 billion on Thursday. Friday's trading left the Dow down 5.7 percent for the week and erased its gains for the year. The S&P fell about 6.4 percent, while the Nasdaq was off 7.9 percent for the week. The S&P and Nasdaq also went into the red for 2010. The Russell 2000 index of smaller companies was off 8.9 percent for the week, and the Dow Jones U.S. Total Stock Market Index fell 834.93, or 6.8 percent, to 11,444.25. The week's losses would put the market about well toward what analysts call a correction, usually defined as a drop of between 10 percent and 20 percent following a sustained rise. The Dow is now 7.4 percent off its recent high of 11,205.03 reached on April 26. The S&P 500 is down 8.7 percent from its recent high of 1,217.28 reached April 23. "We were in the midst of a pullback, we needed one, we got one," said Peter Cardillo, chief market economist at New York-based brokerage house Avalon Partners Inc. Cardillo said the choppy trading after such a drastic decline likely signals the market trying to find a bottom. Stocks have been on a nearly uninterrupted upward path since March of last year, when indexes hit 12-year lows. Analysts have been predicting a correction for months, only to see the market bounce back after brief periods of decline. Long-term market watchers actually welcome occasional pullbacks in stocks, saying that gives investors opportunities to pick up shares at bargain prices. "We had the earthquake, we're now in the midst of getting the aftershocks," said Steven Goldman, chief market strategist for Weeden & Co. in Greenwich, Conn. "When the market's so close to new highs, it's difficult to have rallies. But when you're down 10 or 12 percent from recent highs, we can deal with uncertainty better." The Labor Department reported that employers added 290,000 jobs last month, far more than expected and the biggest jump in four years. However the jobless rate rose to 9.9 percent from 9.7 percent as more people looked for work. The big improvement in the jobs report brought some clarity to the biggest question remaining for the U.S. economy: When employers would start hiring again. Despite positive signs in manufacturing and housing, job creation has been lagging far behind other sectors of the economy, a worrisome point for economists. Friday's report may help change that perception. "It's a good-size number and it had a lot of breadth," said John Silvia, chief economist at Wells Fargo. "There isn't a double-dip out there. The employment situation suggests that we have a sustained economic recovery in the U.S. Companies are hiring people." Apple fell $10.39, or 4.2 percent, to $235.86. Oil fell, and gold rose. The dollar was mostly lower against most currencies. The euro clawed back some ground against the dollar after several days of declines. European markets were broadly lower. The declines were deepest in France, where the CAC-40 index tumbled 4.6 percent. Germany's DAX fell 3.3 percent and Britain's FTSE 100 fell 2.6 percent. Japan's Nikkei fell 3.1 percent.